Here's another reason that I have no business starting a Sherlock Holmes blog; but I suppose this is something I need to confess up front. My first experience of Holmes was not the Canon. In fact, I came to Doyle late. My first experience of Sherlock Holmes in print was a pastiche novel: The Seven-Per-Cent Solution by Nicholas Meyer. 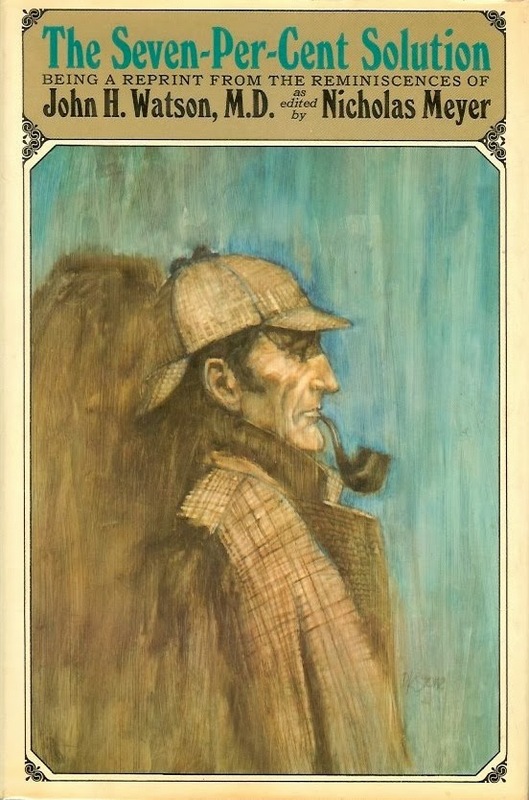 Part of what made this book special was that Meyer wrote it as John Watson and presented it as a lost adventure with himself credited only as "editor." Today that is almost the standard way to present a Holmes pastiche, but this was a pretty original idea back in 1974 when the book came out. I'm not Holmes expert enough to know whether Meyer was the very first person to write a Holmes novel in the voice of John Watson, but he might have been. He also brilliantly turns the Moriarty story on its head, and shows us Holmes as a drug addict, but you know all this. Pictured above is my cherished signed first edition hardcover. No, it's not Doyle; but I think Meyer's book could be the most significant non-canonical work of them all. It certainly seduced me into the world of Baker Street.